Monkey and The Frog: Happy Canada Day!!! Canada Day (French: Fête du Canada), formerly Dominion Day, is Canada's national day, a federal statutory holiday, celebrated on July 1 annually by Canadians. 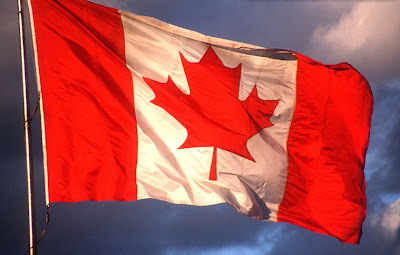 Canada Day observances take place not only throughout the nation, but also internationally (in Sausalito, we will be celebrating by enjoying a Moosehead or two or three). Frequently referred to as "Canada's birthday," particularly in the popular press, the occasion marks the joining of the British colonies of Nova Scotia, New Brunswick, and the Province of Canada into a federation of four provinces (the Province of Canada being divided, in the process, into Ontario and Quebec) on July 1, 1867. However, though Canada is regarded as having become a kingdom in its own right on that date, the British Parliament at first kept limited rights of political control over the new country, which were shed in stages over the years until the last vestiges were ended in 1982, when the Constitution Act patriated the Canadian constitution. Canada Day thus differs from Independence Day celebrations in other countries in that it does not commemorate a clear-cut date of complete independence.